In the town of Churubusco, Indiana there is a small diner called the “Ramble Inn.” It has served the 2,000 residents of Turtle Town USA since well before I was born. When I was in college at Ball State University I would work during the summer break and return to Churubusco, where I grew up. The Ramble was the only place in town that was open 24 hours, so it was a favorite stop for me and my friends after a night out on the town. I would always order the restaurant's signature breakfast called the He-Man, with a half order of biscuits and gravy on the side. I was a sucker for the He-Man because of my obsession with the toys in the past. It included two eggs, hash browns, sausage or bacon and toast. 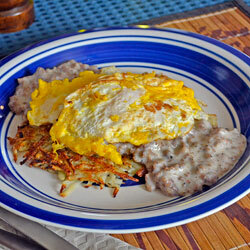 Thrown in the biscuits and gravy and you got all of my favorite breakfast flavors. 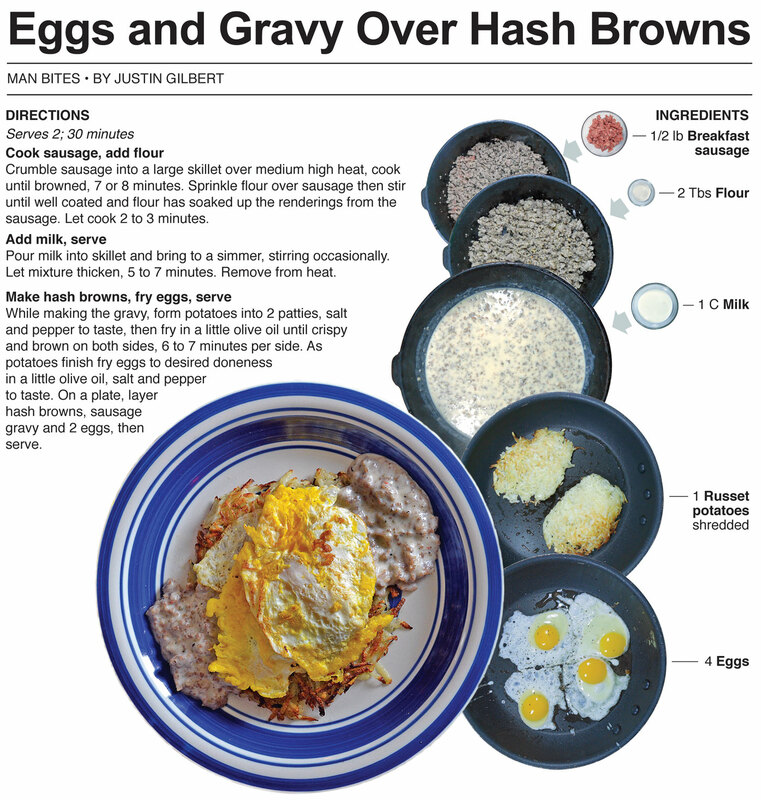 For this recipe, I take my favorite parts of the He-Man with biscuits and gravy and combine them on one plate. 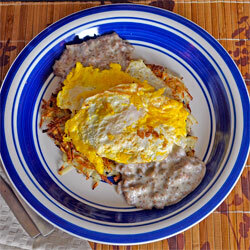 The result is fried eggs and sausage gravy over a huge hash brown. I have been making this plate for a long time. 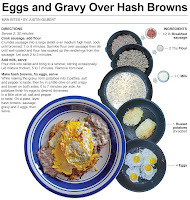 I love hash browns and there is nothing better than sausage gravy, I consider it nectar of the breakfast Gods, and I summon great powers from ingesting it. 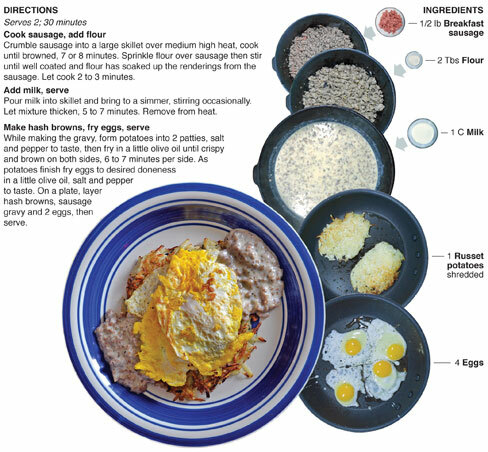 (Well, that’s a little dramatic, but this is my version of a breakfast named He-Man after all.) It may look like a mess on the plate but this is my favorite morning bite and would eat it everyday if it were a little more healthy. This was the 100th print column that I have published. It’s a milestone that I’m really proud of. The introduction that ran in the paper was totally different because the readers are familiar with the restaurant and town so I reworked it for webland. It is the first time that I have completely scraped the print intro, which is roughly 200 words. It was nice to not have a word count when I started this post. It is much more difficult to write a 200 word story than it is a 400. Sounds ironic but it is the truth. It forces you to edit, and that can be the toughest part of writing.